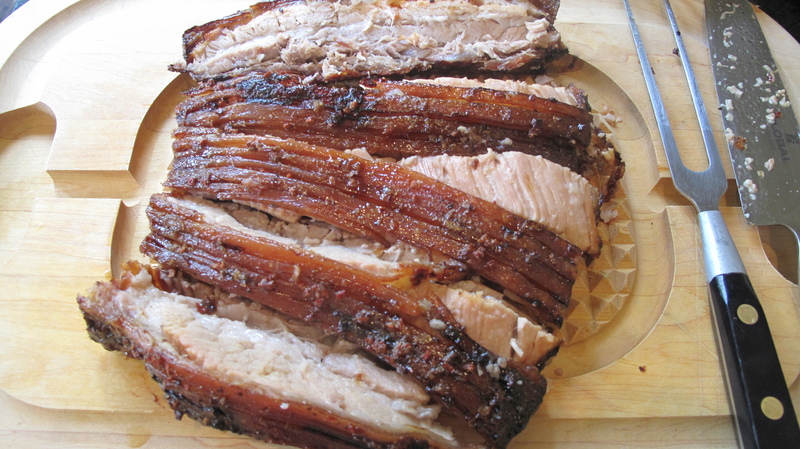 This weekend I decided to go for the mother of all comforting roasts: pork belly. These days, a roast can seem like an expensive treat. However, choose the right cut and you don’t have to spend much to be rewarded. This fed 5 people, and only cost £6. Alarmingly, the raw product prior to cooking really does look like you’re about to eat one hell of a big chunk of bacon. Technically, that’s true. However, once slow cooked for hours the fat melts into the meat making this succulently tender and giving the ever-important crackliest of crackling. I’m not saying it’s healthy, the opposite in fact, but there are moments to be healthy, and moments to gorge on ye suckling pigge. Buying your pork from a good butcher really will make all the difference here, for both taste and price. My lovely local Butcher provided me with this beautiful hunky-looking piece, and scored the fat for me so it was easy to carve once cooked; ask yours to do the same. 1. 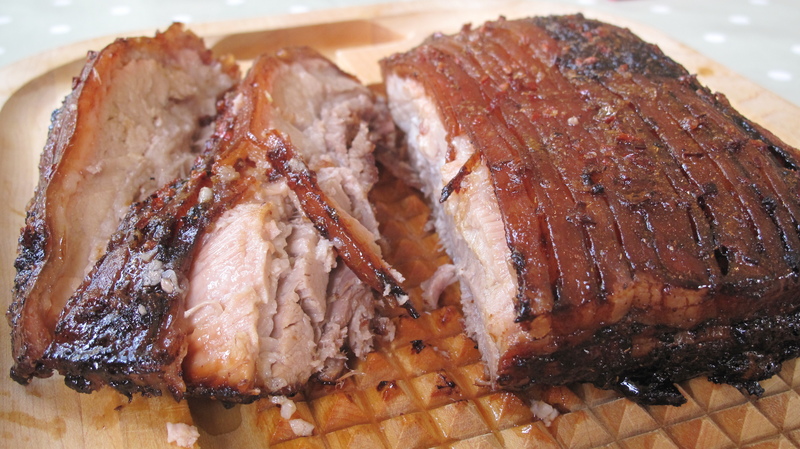 Place your pork on a rack in a roasting tray- this is important so that the cooking juices and fat drip down into the tray and the pork can crisp rather than roasting in its own juice. Rub a good pinch of sea salt, pepper and olive oil onto the skin. Roast for 1 hour. 2. After 1 hr, spoon the juices over the skin (basting). Cook for another hour and a half, basting every half hour. 3. Finally, mix the honey, cumin and chilli together, before spooning it over the skin. Add the onions and carrots to the bottom of the roasting tin. Return to the oven for a final 40 min. 4. Remove from the oven, leave to rest for 15 min. 5. Set the pork aside, and place the roasting tray with the juices, onions and carrots directly onto your hob on a low heat. Add a mug of boiling water and stir, careful to scrape all the goey bits off the bottom of the tray. 6. 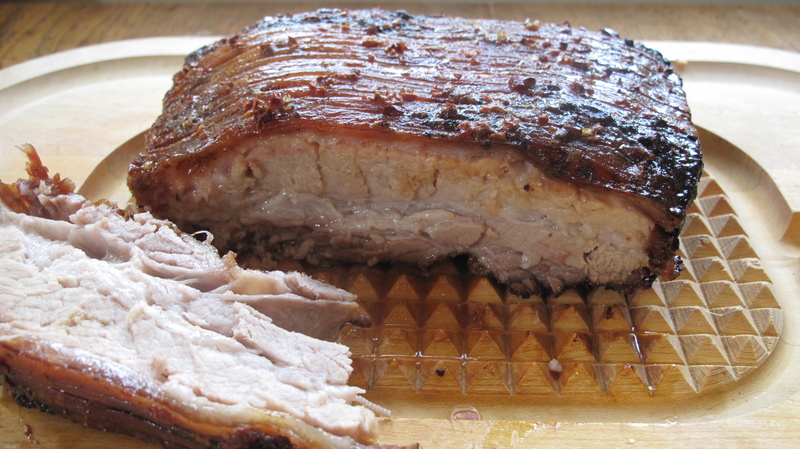 Carve the pork into think slices and serve with the sauce. They sound French, they sound fancy, they are however incredibly easy. 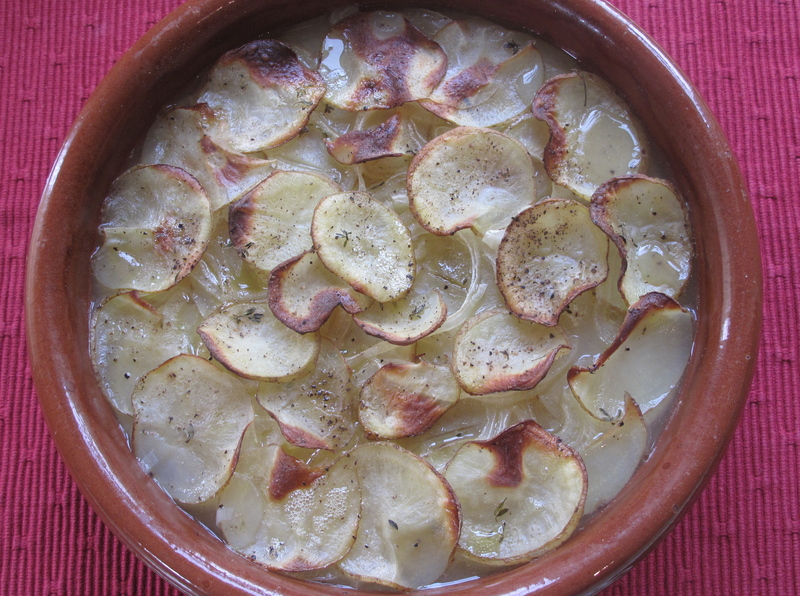 The skinny cousin of dauphinoise potatoes, these don’t have any cream but a stock sauce instead, so that they are still goey and comforting but not rich. I partnered them with the slow-roasted pork for this reason, as they cut through the richness well. I haven’t given amounts here, as I usually pick the size dish I want depending on how many I’m feeding and proceed to fill it accordingly. Choose a baking dish about 2 inches deep. 1. 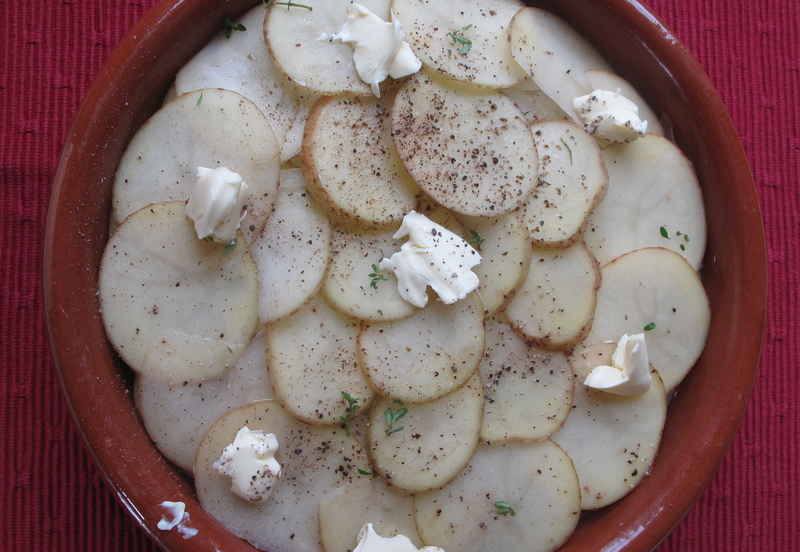 Butter your baking dish. 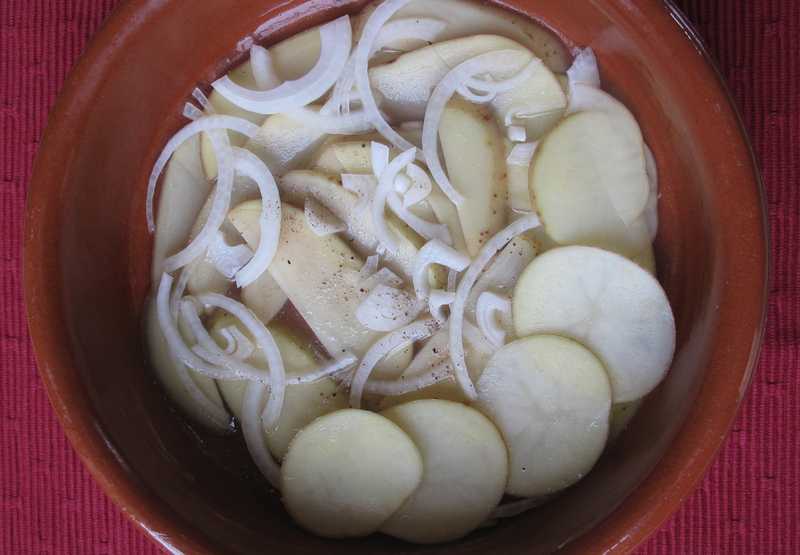 Start with a layer of potatoes, followed by a layer of onions. Season with salt and pepper. Continue this way, remembering to season each layer. 2. Pour over enough stock to just reach the top layer. 3. Dot liberally with butter and the thyme. 4. Cover, and cook in the oven for 1hr. Uncover and continue cooking for another 30-45 mins. 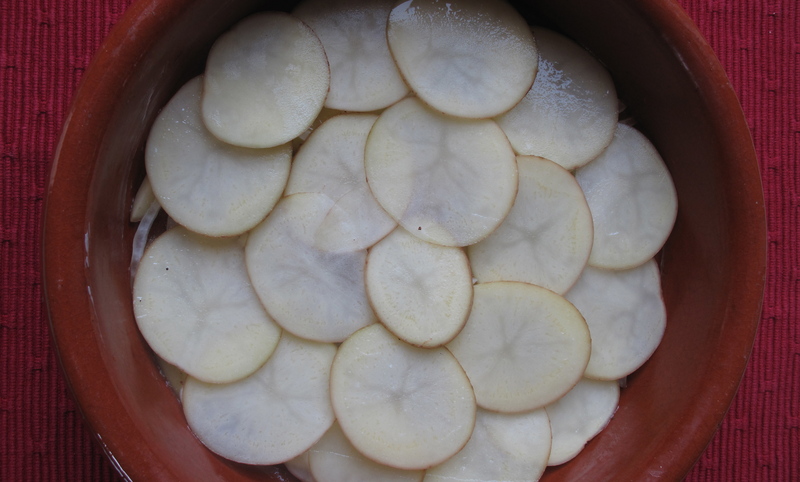 The potatoes should be golden on top, and the stock absorbed into the potatoes to make them goey and soft. This entry was posted in Meat and Poultry, On a Budget and tagged pork. Bookmark the permalink.